Italian born and raised, Davide Barbieri discovered his passion for hair styling whilst studying Fine Art in Tuscany. The beauty and the complexity of hair styles in Renaissance paintings inspired him and David began his hair training, graduating from a prestigious Hair Academy in Pisa. Always interested in the culture and fashion in London, Davide re-located to pursue his career dreams. 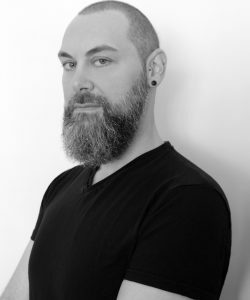 After working in a couple of leading salons and becoming fluent in English, Davide ventured into session styling becoming a regular backstage at London, Paris and Milan fashion week working closely with some of the most important and influential session stylists in the industry. He assisted legendary Christiaan Houtenbos on photo shoots learning invaluable techniques which inspired him further. Now established in his own right with a strong and varied client base, Davide is an all-round artist merging creativity with classic techniques creating beautiful shapes and unique hair textures as well as incorporating his traditional barbering skills. Anything is possible for Davide, whether the look is sleek, chic and simple or highly complex and creative. His editorial work has been featured in magazines such as Vogue Italia, L’Officiel, GQ, PIBE, Hunger, Bazaar, Wonderland, Elle and Volt. Davide’s celebrity list includes Rosamund Pike, Elle Fanning, Vanessa Kirby, Suki Waterhouse, Jenna Coleman, Hannah John Kamen, Gabriella Wilde, Iris Law, Lily Allen, Holliday Grainger, Gerard Butler, Lennon Gallagher, Robbie Williams, Anthony Joshua, Ansel Elgort, Douglas Booth, Dane DeHaan and Harris Dickinson.